Nowadays, Blu-ray has been very popular among people who like to enjoy movies at home. Movies in Blu-ray Discs have better quality in both visual effect and sound effect, and can bring better watching experience to us, and that’s why more and more people prefer Blu-ray over DVD, when DVDs can only offer movies in limited quality. However, we all know how to play a Blu-ray disc, which is as easy as playing a DVD disc, but not many people know very much about blu-ray folders. It’s okay that you don’t know about it if you only need to play Blu-ray discs, but when you find yourself dealing with a Blu-ray folder on your PC, or you are trying to burn a Blu-ray disc yourself, you will need to know something about Blu-ray discs. We have introduced DVD folder structure in the pasy, but what is Blu-ray folder structure? DO we need a Blu-ray folder player? How to play Blu-ray folder on PC? And how to create a Blu-ray folder? This article will soon help you find out. AACS: A directory file. It contains disc level content certificates and media key block data. BDMV: A directory file. It contains basically all the meaningful content of the disc. AUXDATA: A directory containing assorted disc-specific metadata. BACKUP: A directory containing subdirs with backup copies of certain small content. Like .BUP files on DVDs. BDJO: A directory containing BD-J objects, on discs that use BD-J. CLIPINF: A directory containing metadata files for the M2TS streams in the STREAM subdir. META: A directory containing subdirectories with a metadata XML file, and sometimes thumbnail images, depending on who did the authoring. PLAYLIST: A directory containing binary playlist files, which describe the playback program chains. Some studios use playlists to implement seamless branching (Disney loves to do this, especially with their animated movies, subbing in language-specific segments for opening titles, credits, etc.). STREAM: A directory containing the actual audio/video streams, in MPEG-2 transport stream format. index.bdmv: A metadata file containing an index of the titles. MovieObject.bdmv: Some sort of object metadata file describing the movie(s) on the disc. CERTIFICATE: A directory, contains security certificates that the application(s) on the disc use, including occasionally revocation lists and such. 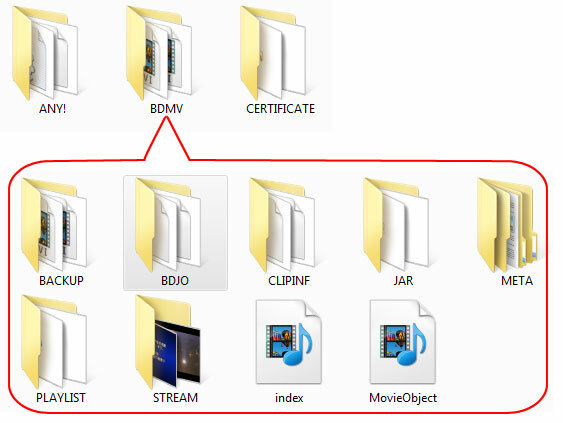 Now that we know the Blu-ray folder structure, the problem is, how to create a Blu-ray folder? Do we create all the files in the Blu-ray folder one by one? Or is there an easier way to create Blu-ray folder? Of course, there is. 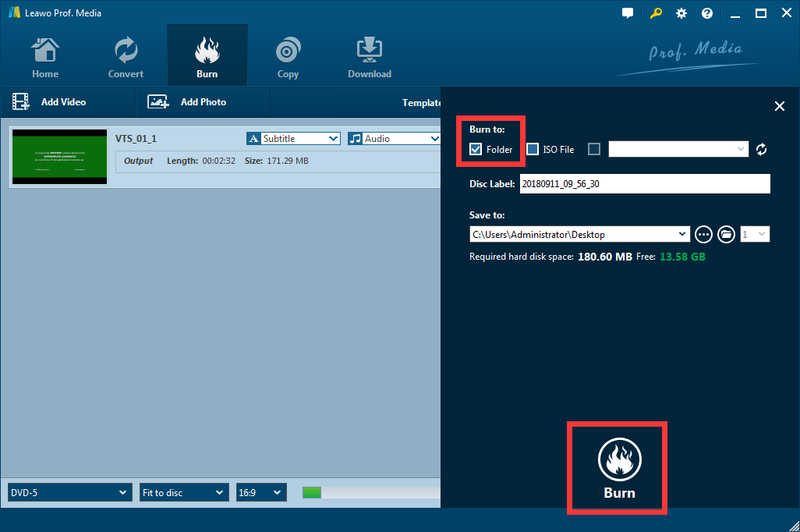 To create a Blu-ray folder, all you need is a Blu-ray burning software that has Blu-ray folder output support. 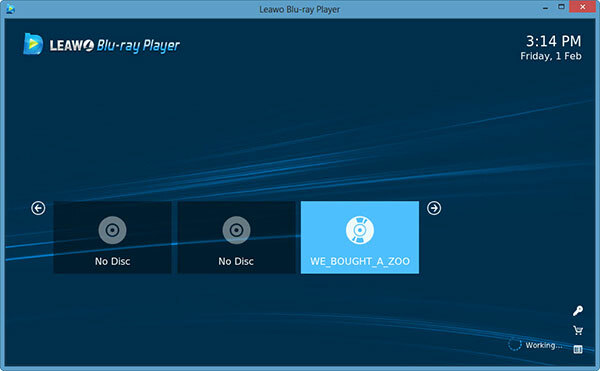 Leawo Blu-ray Creator, for instance, is a good one among all the Blu-ray burning programs. ☉ Burn videos to Blu-ray/DVD disc, folder or ISO file. 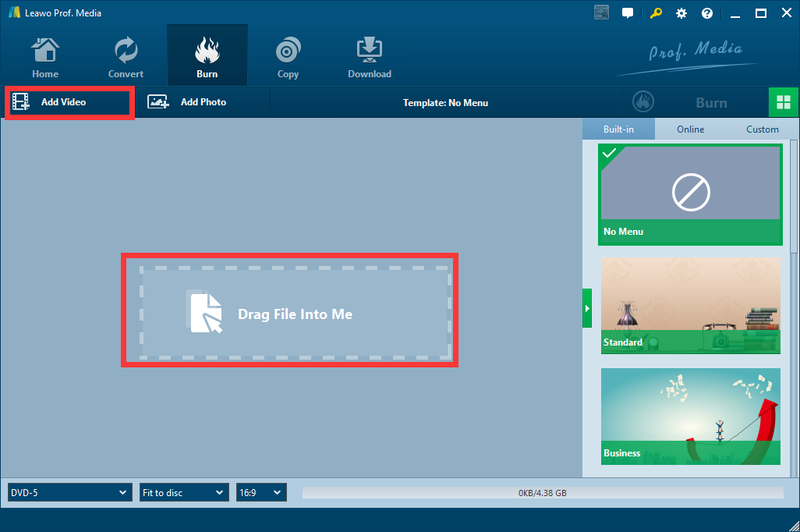 ☉ Create photo slideshowand burn to DVD/Blu-ray disc. ☉Edit output videos to add watermark, trim, adjust effect, etc. ☉ 6 different 3D effects. As a Blu-ray burning program, Leawo Blu-ray Creator supports various video files like MP4, WMV, MKV and so many more as input and can burn them to a Blu-ray disc with the original quality retained. What’s more, it can also create Blu-ray photo slideshow with background music. As for Blu-ray folder, you can choose to generate a Blu-ray folder before the burning process and the software will help you to create a well-organized Blu-ray folder for you. Here I’ll show you how. 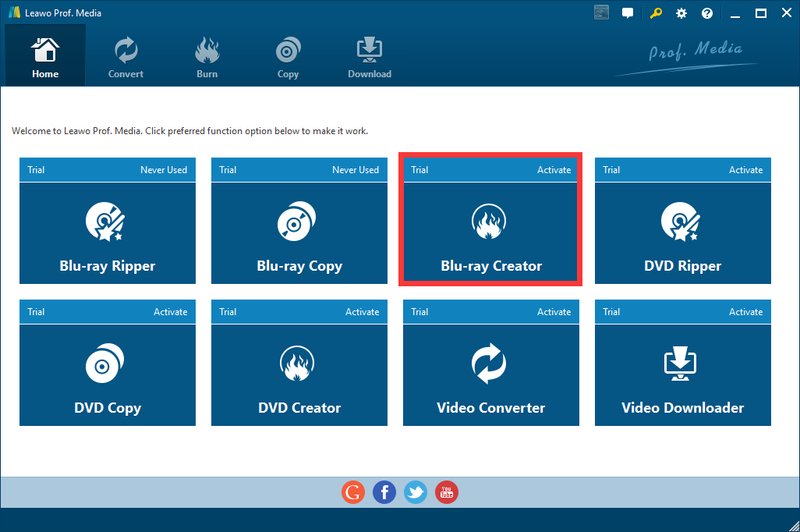 Step 1: Download and install Leawo Blu-ray Creator. Step 2: Open the program and enter the “Blu-ray Creator section”. Step 3: import your movie or video by clicking the “Add video” button or simply drag your file into the main frame. Step 4: You can do many editing like cropping, adding watermark or adding 3D effects by clicking the edit button, and choose a menu template on the right, or just burn the original video. Step 5: Click on the green “Burn” button, then check the checkbox of burning to folder to generate a Blu-ray folder. Step 6: Click on the “Burn” icon below to start burning process. 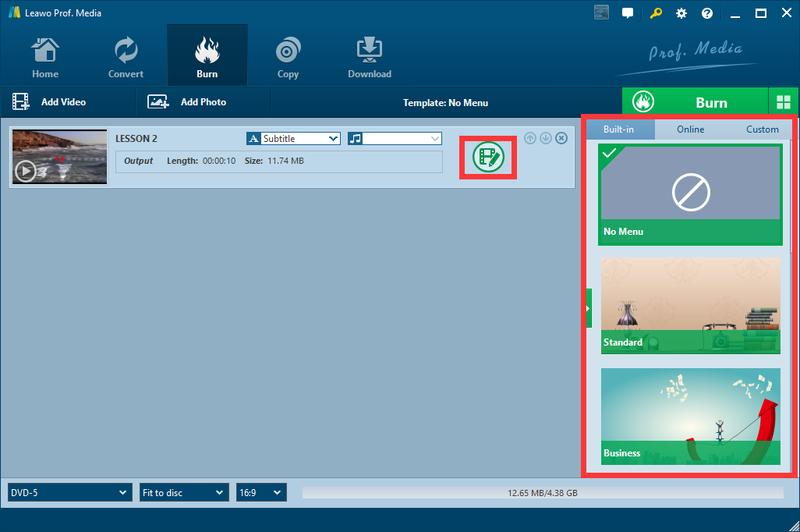 Now that we know how to create a Blu-ray folder, there remains one last problem, how to play Blu-ray folder on PC. Most media player like Windows Media Player cannot play Blu-ray materials, to play Blu-ray folder, you need a Blu-ray folder player, or, a universal player that can play Blu-ray, DVD and digital video files as well. Does this kind of media player exist? The answer is yes. Leawo Blu-ray Player is a free universal player that can play not only Blu-ray folder, but also Blu-ray/DVD disc, ISO files and all the digital video files you need to play everyday. The player can play all the files in the original quality so that you can get the best watching experience. What’s more, when playing DVD or Blu-ray materials, it can play them across region so that you are not limited by the annoying region code of your disc. Leawo Blu-ray Player is the best Windows Media Player alternative you can get for free. Today we talked about Blu-ray folders. We learned the Blu-ray folder structure and we learned how to create and play a Blu-ray folder. Blu-ray folder structure is a little bit complicated, but with Leawo Blu-ray Creator, you don’t need to worry about the Blu-ray folder structure, the software can generate the folder automatically for you. If you want to play a Blu-ray folder, you can choose Leawo Blu-ray Player, the free media player can certainly suffice your needs.